Every morning when seven o’clock rolls around I turn off my alarm and protest having to get out of bed. I shuffle down the hall to wake up Liam, wish Teen a good day as he head out the door and then I wander down stairs to start breakfast and make coffee. I don’t think about doing any of this, I just do. It’s one of the many simple routines that make up my day. I’m sure you have a few of your own like it. They are the things we do without conscious thought. They are the little things that keep our days moving forward. It might sound like no big deal, but these simple routine are extremely effective in helping us hold on to our sanity in scattered world. What are Simple Routines and Why are They So Effective? 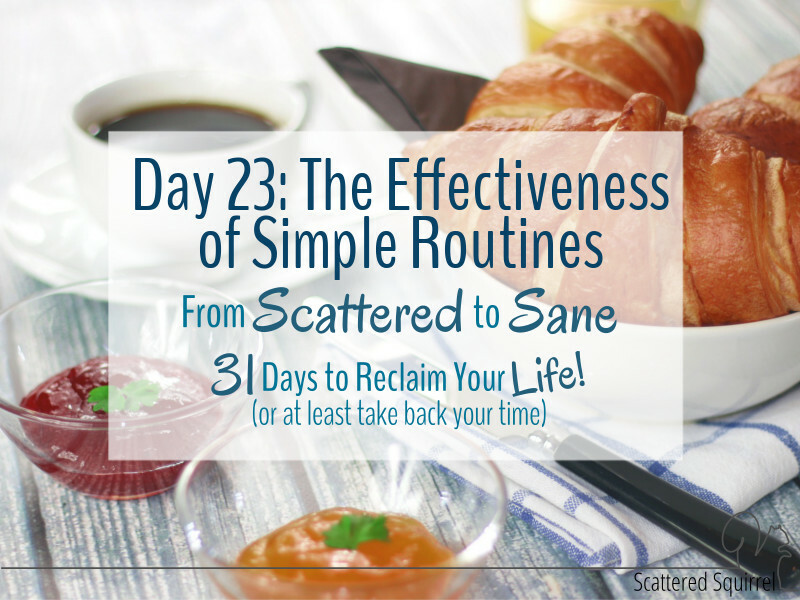 I call them simple routines, I’m sure time management gurus have a fancier name for them. Simple routines are the things we do everyday that we don’t really think about. 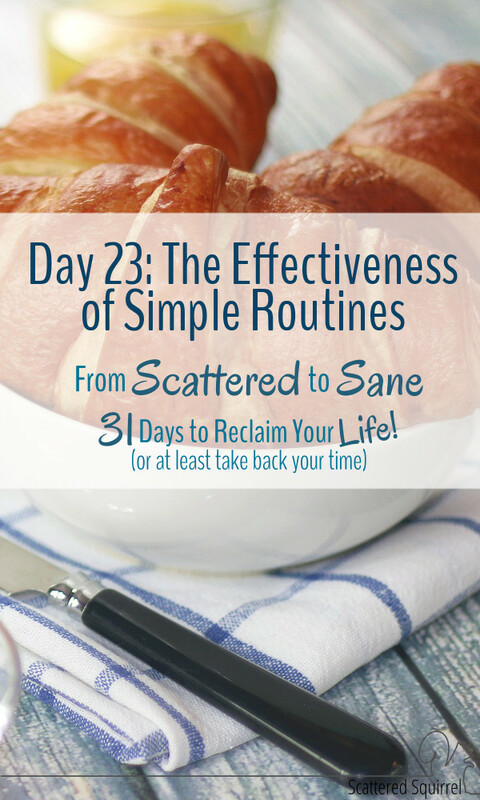 Everything from waking up, to leaving the house, to how we do our shopping, they can all be simple routines. You aren’t really aware of them until you start really thinking about things. Have you ever had one of those moments where you don’t really remember doing something but you know it’s done? Like you don’t actually remember your drive to work or you walk into the kitchen after dinner and realize you already cleaned it, though you don’t actually remember doing it. These are simple routines at work. We have done them so often and for so long that sometimes we do them without even realizing they are done. These routines are so effective because we don’t think about them. They are so ingrained in us they are second nature. They are as natural as breathing. It is their simpleness that makes them of effective. Usually they are comprised of little, single steps that propel us from point A to point B. Like in my example above, I do one thing at a time and I follow the same thing everything morning. If Liam is up early, or I wake up early so steps might get skipped, but for the most part, that is what my morning look like every single day. If I had to give conscious thought to each step taken first thing in the morning I’m pretty sure I would need to be up at least an hour earlier to get everything done on time. I am not a quick thinker in the morning. So how do we take these simple routines and make them work in our favour? We have a bunch of these second nature routines sprinkled through out our days and they are just waiting for us to make use of them. The easiest way to get the most out of these routines is to add to them bit by bit. Because they are already so ingrained in us, completely changing them isn’t going to be much help, but adding one step here and another there can go a long way towards helping reclaim our time. To make the most out of these simple routines, think about the little things that you need to do every day, and try to figure out if you can tie them into one of these routines. To continue with my morning routine, I could add start getting dressed before I leave my room in the morning. It’s something I need to do in the morning every day anyway, so it would fit in nicely with my simple morning routine. The upside to adding one small thing to one of these routines is that because they are so ingrained in us it doesn’t take as long for the new task become absorbed and incorporated into the routine. Make sure to give yourself at least three weeks before adding in another task if desired. Again to continue with the morning example, I pack lunches at night. Perhaps pulling them out and putting them in Liam’s backpack after I put on the coffee could be another item to add to the list. Another thing you can do is to use your simple routine as springboards for larger and newer routines. For example – I decide that I want to start having my shower first thing in the morning instead of at night. Instead of trying to drastically change my morning routine, I follow it like normal, but once I have poured my first cup of coffee I go hop in the shower. I’m adding a whole new routine into my mornings, but I’m using my simple morning routine to kick-start it. This way things flow a little more naturally. Building this newer routine might take a little longer than just adding in little steps, but it will be easier to build it this way than to try to completely redo my whole morning routine. Finding ways to tie your small, every-day tasks into your already solid albeit simple routines is another small step to take on this journey from scattered to sane. Every bit helps, and taking these steps will help to free up your time and energy so you can focus on those foundation routines and making room for new things. 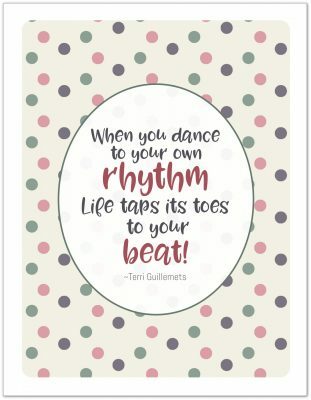 So take some time to think about the simple routines that make up your day, and give some thought to what you can add to them or how you can use them to help build new routines. You don’t have to take any steps if you don’t want to, I just want you to think about ways you could use these. Is there a simple routine you can tie one or more of your daily three things too? What about one of your weekly things? I’d love to hear your thoughts on this. What are some of the simple routines that make up your day?